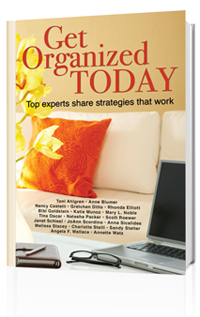 "Get Organized Today, Top experts share strategies that work"
"Get Organized Today is a wonderful, practical book—pulling together some of the best minds in the industry to help you live a richer, more organized and more meaningful life. Whether you need strategies for restoring order at home or at the office, this beautifully organized (of course!) collection of ideas will be an invaluable resource to you every day." Before you can get organized you need to know who is going to help you! Whether it is information or spatial organizing, time management or systems consulting, partnering with the right professional organizer facilitates your project satisfaction. The clients of professional organizers vary as much as the Seattle weather. The right professional organizer will help you discover what you need if you are not certain or if you are certain, how best to achieve the results you want. Everyone needs a professional organizer at some point in their life. Wether it is for a professional purpose or personal reasons there is someone ready to help you. But how do you find them? If you have answered these questions then you are ready to begin your search for a professional organizer. Can you answer these questions? What does the professional organizer or company specialize in? Do I want a team of organizers or just one? What is it I want organized? Bring Natasha's expertise to your office! Enjoy her clear and concise talk on the many aspects of organizing. How it affects our daily lives as well as productivity in our work. Do you need some fresh ideas or a new perspective? She’s got it! As an effective teacher of new habits and simple techniques in professional organizing, you’ll want to rush to implement your newly discovered life maximizing ideas.